Hello beauties, today I wanted to share a couple of my favourite skincare treats and give you some inspiration for your next at-home spa /pamper session. Ella Baché has recently launched some great new products that deliver everything you could want for your skin. Capturing one of the richest sources of antioxidants, this lightweight cleanser gently exfoliates and works to draw out dirt and excess oil that gets trapped inside pores. Perfect for all skin types, including sensitive skin, this cleanser works wonders for my complexion. The unique three active textures, containing satin oil with Papaya Enzyme forms into a soft white emulsion when activated by water leaving my skin feeling smooth and squeaky clean. Directions: Take a small amount of product in your hand and gently massage onto your dry face and neck, then emulsify with warm water to activate enzymes. Massage over the face with light circular motions, avoiding the eye contour area. Rinse well with water. There’s a new mask in town and it’s about to knock your socks off. This extremely rejuvenating mask offers 7 positive skincare actions in one. Cooling, rehydrating, plumping, smoothing, softening, anti-ageing and protection with anti-oxidant properties. Made of bio-cellulose microfibers from fermented coconut water that acts like a second skin, it also dispenses a combination of active ingredients of Hyaluronic Acid and Collagen. The mask sits firmly on my face and guaranteed after each use my skin feels hydrated, plumped and refreshed. Application: Apply the mask to the face by pressing gently onto facial contours. Peel off the remaining protective blue layer on top and smooth mask over the face avoiding the eye area. Leave on the face for 15 – 20 minutes. Remove and discard mask but do not rinse off residue. Instead, massage remaining product into the face and neck. 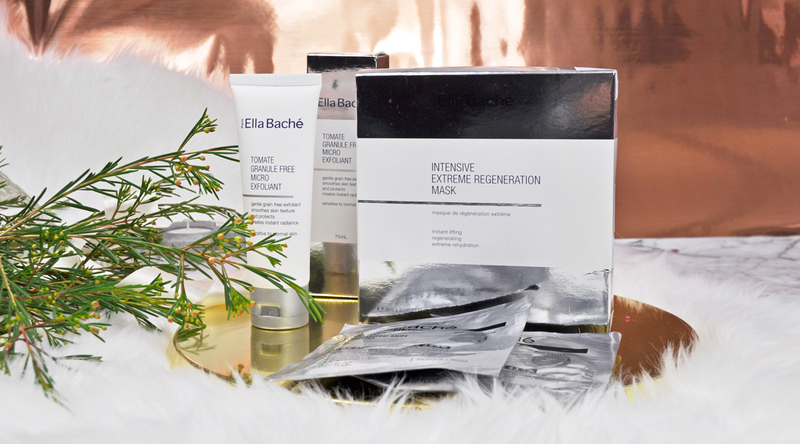 Price: Ella Baché Tomate Granule Free Micro Exfoliant | RRP $72 – Ella Baché Intensive Extreme Regeneration Mask | RRP $78 for 2 sheets. Available at all Ella Bache salons, David Jones stores and the Ella Baché online store. What are some of your at-home pamper rituals? I love the idea of an at home spa / pamper session! 🙂 The mask sounds especially divine. I do masks about twice a week and I do mani / pedis on myself once a week! I always feel so pampered afterwards… and didn’t break the bank! I received that mask too, I am so excited to try it out, it looks amazing! I love the sound of that exfoliant as well! Even though I have certain things for a current pamper at home session, this makes me want more!!!!!! 😍👌 I do a mask, L’Oréal pure clay mask, and then have a shower with Natural Instinct Relaxing Body Wash Lavendar and Rosehip and put on a candle and drink white tea blueberry and elderflower. I am always looking for more things to create a relaxing ambience for myself! I’m really into mindfulness at the moment. I love the “Twinings Sleep” tea too!